Gene Martin came through for the Sumter Braves in this May 1990 contest. With the bases loaded and two outs in the third, Martin rapped a single to tie the game at two, The Sumter Item wrote. It was one of two hits Martin picked up in the Sumter win and the latest in a streak of good hitting for the young outfielder, according to The Item. "Martin has been outstanding both offensively and defensively lately," Sumter manager Ned Yost told The Item afterward. "He had some big hits for us today." Martin got those hits in his second season as a pro. He couldn't keep it up. That season was also his last as a pro. Martin's career began in 1989, taken by the Braves in the 60th round of the draft out of Imperial Valley College in California. When Martin turned pro, he became a second-generation professional player. His father Alvin "Lefty" Martin played in the Angels system in the 60s. 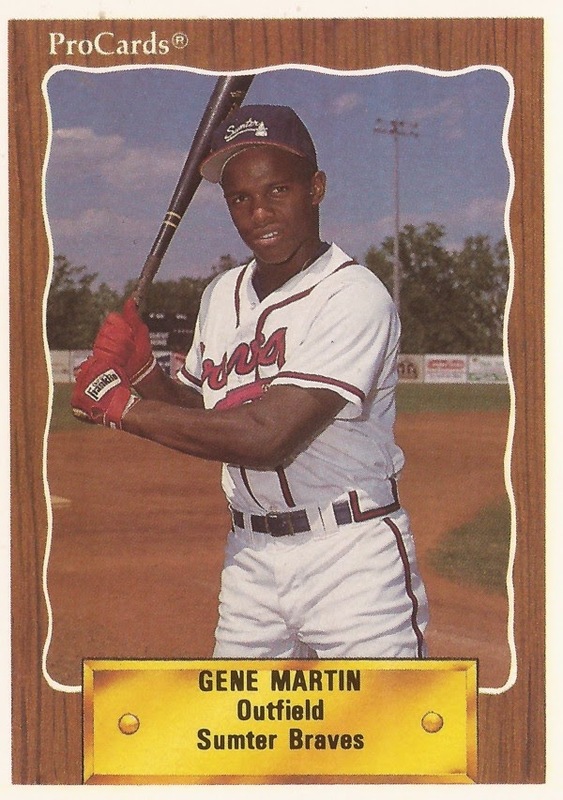 As Martin signed with the Braves, The Imperial Valley Press noted that the father, who was also the local high school coach, traded advice with the Braves scout. "The way I look at it, at least we’ll be the first father-and-son combination to come out of the Valley that played (professionally)," Lefty Martin told The Press. Martin played his first year in the rookie Gulf Coast League. In 41 games there, he hit .186. He had 12 RBI and stole 10 bases. He moved to single-A Sumter for 1990. He picked up two hits in a late July game, hitting a home run. On the year, though, he hit just .232 in 79 games. He didn't get a third pro season. His playing career over, Martin soon returned to the Imperial Valley and Central Union High School. Martin's father continued as Central Union head coach until just before his passing in 2012. Gene Martin then took over as head coach himself.